Peruvian grown Pima cotton is considered by many to be one of the best fabrics in the world! 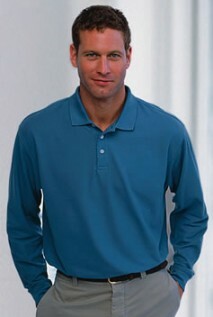 Soft and natural, the extra long Pima fibers give this shirt a comfortable wear that can not be beat! All the extras are here as well: Lyrca Ribbed cuffs to hold shape, double needle stitching for durability, Dura-Pearl buttons and neat looking collars. AS - 22" x 26.5" 12" x 12" 12" x 12"
AM - 23" x 29.5" 12" x 12" 12" x 12"
AL - 24" x 30.5" 12" x 12" 12" x 12"
AXL - 25" x 31.5" 12" x 12" 12" x 12"
A2X - 26.5" x 32.5" 12" x 12" 12" x 12"
A4X - 29.5" x 33.5" 12" x 12" 12" x 12"
Testimonials from customers who ordered item B359 and left a comment in their survey.